Years of delays and repeated failures to implement and improve sewage and drainage systems in Ghana’s capital, Accra, has led to increasingly damaging and deadly flooding during the country’s annual rainy season. Thirty-eight-year-old Gertrude Otobia Darko was at home with her eight children and husband on the night of 3 June when her house began to flood after days of steady rainfall and then hours of heavy downpour across the city. Trapped inside, Darko and her family shouted and waved for help, from within the pitch black room, as the rain poured in. Soon the water was about four feet high, up to her chest. Eventually some neighbours were able to break down the door to let them out. But not before the water dragged Darko's three-year-old son away. Neighbours eventually found him submerged, with water in his lungs. His rescuers wanted to take him to the hospital, but were unable to get through the water. Days later, the child is still unwell, yet to recover from the ordeal. Ghana usually sees an average of 221mm of rainfall each June, according to the country’s Meteorological Agency. This year, an estimated 250mm of rain fell in the first three days of the month alone. It was the biggest storm in the past 20 years. But the streets of Accra tend to flood even during times of average rainfall. In some communities, structures have been built on waterways, blocking the water-flow. Drainage and sewage systems across the city are primitive and easily overflow. A lack of public trash bins also means that litter is often discarded without care, further choking the gutters and blocking the flow of the water. For years there has been talk of the government working with development partners to install a proper drainage system that would collect the rubbish that clogs the city's streets, gutters and beaches. But the project has yet to materialise. According to the mayor of Accra, Alfred Oko Vandepuije, the funds have been stuck at the Ministry of Finance since April 2013. The Ministry of Finance says it has not received the loan. The US Exim Bank, which is supposed to finance the project, confirmed that no plan has been finalised. Now the money just needs to be disbursed. In 2005 Ghana committed to the 10-year Hyogo Framework for Action that seeks to reduce disaster risk. The framework, which includes dredging and drainage systems in some parts of Accra, is still either incomplete or yet to begin. The duration of framework ends this year. In 2011, the former regional minister for Greater Accra created a Platform for Disaster Risk Reduction and Climate Change Adaptation in Accra. But that too has not yet been activated. IMANI’s Cudjoe told IRIN that corruption, political appointments, poor leadership and lack of regulation continue to lead to flood-related disasters. This month’s most recent storm, on 3 June, which led to an explosion at a petrol station, killed more than 150 people and affected thousands of others. It is just the latest example of the country’s failure to properly institute disaster risk reduction management, observers say. Across Accra, collapsed walls now lay in puddles of mud. Many families have been forced to take refuge with neighbours. Many residents say they are aware of the dangers and risks that the rains bring each year, but that there is little they can do. Hawa, for example, who owns a cosmetic shop, was warned by her brother that the rain was getting heavier and heading in their direction. As predicted, the downpour soon descended on them as well. Like many others throughout the city, her store was destroyed by the floods. She, like Darko, who also lost her store, has no way of setting up shop again. In Accra, as the rains intensify each year, so does the risk of cholera. In 2014, there were an estimated 28,000 cholera cases in Ghana, according to Greater Accra’s Regional Disease Control Officer Ato Ashon. More than 20,000 of them were found in Accra, following heavy rains and flooding. In the wake of this most recent flood, and with many weeks still to go before the rainy season ends, the Greater Accra Regional Disease Control Centre says it has been sending more nurses into the communities to educate people about cholera prevention, in attempt to stave off another outbreak. Ghana’s National Disaster Management Organisation (NADMO) began, last week, distributing relief items to families around Kwame Nkrumah Circle, where the deadly petrol fire broke out, but failed to reach the majority of other affected areas until the start of a four-day campaign that began 8 June. Following last week’s flood, Ghana's President John Dramani Mahama announced, on 5 June, that $12 million will be directed to support the flood and fire victims with relief, as well as used for infrastructure and waterway clearing projects. 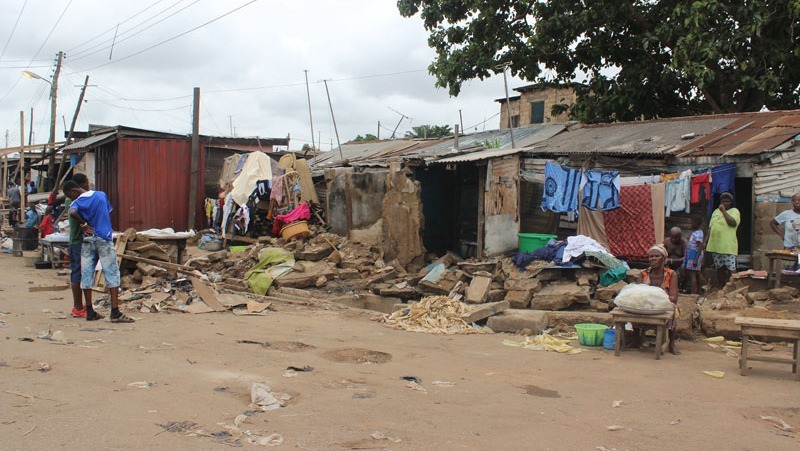 Demolitions of informal structures, which block the current gutters and drains, also began in parts of Accra on 5 June, although mainly aimed at small constructions. Larger buildings and complexes like the luxury Villaggio residential properties, which is built on a known water basin, are rarely regulated. But for Darko, Hawa, their neighbours and the many families across Accra whose lives were devastated by the floods and fire, prevention would have been better than a cure.